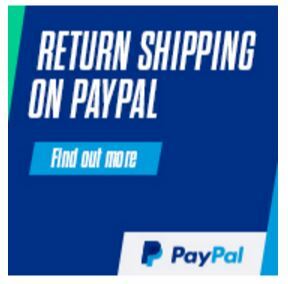 You save £21.00 that's 53% off! Until recently it has been difficult to find a E27 LED bulb that is bright enough to replace the traditional 100W filament lamp (Srew fitting) with a similar light output. 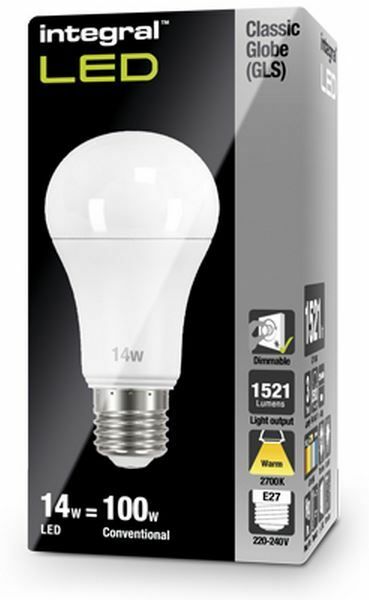 To meet the demand, Integral initially launched a retro-fit 16W LED bulb. 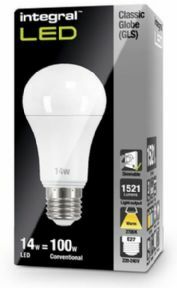 Due to recent advancements in technology further efficiencies have be achived to reduce the power even further to 14W LED at still deliver a massive 1521 lumens which is more than adequete to match a traditional halogen or tungsten 100W bulb. This delivers the required light output but with the massive advantages of LED technology including 86% less energy consumption - 86 less Watts (when compared to filament), in addition there is no warm up time like energy savers as LED technology is instant on. Maintenance is reduced due to lifetime of up to 25000 hours which is approximately 12X longer than traditional lamps which had a lifespan of 2000 hours.